countersunk, internal wrenching, and hex head styles. MS bolts come in internal wrenching and hex head styles. Head markings indicate the material of which standard bolts are made. Head markings may indicate if the bolt is classified as a close-tolerance bolt. See figure 5-3. Additional information, such as bolt diameter, bolt length, and grip length, may be obtained from the bolt part number. SCREWS The most common threaded fastener used in aircraft construction is the screw. The three most used types are the machine screw, structural screw, and the self-tapping screw, as shown in figure 5-4. Figure 5-4 also shows the three head slotsstraight, Phillips, and Reed and Prince. Structural Screws Structural screws are used for assembly of structural parts, as are structural bolts. They are made of alloy steel and are properly heat-treated. Structural screws have a definite grip length and the same shear and tensile strengths as the equivalent size bolt. They differ from structural bolts only in the type of head. 5-3 ANF0503 COUNTERSUNK HEAD BOLT INTERNAL WRENCHING BOLT DRILLED HEX HEAD BOLT CLEVIS BOLT EYEBOLT CLOSE TOLERANCE (STEEL OR ALUMINUM ALLOY) ALUMINUM ALLOY (62,000 P.S.I.) CORROSION RESISTANT STEEL (125,000 P.S.I.) STEEL 125,000 P.S.I) STEEL (150,000 P.S.I.) 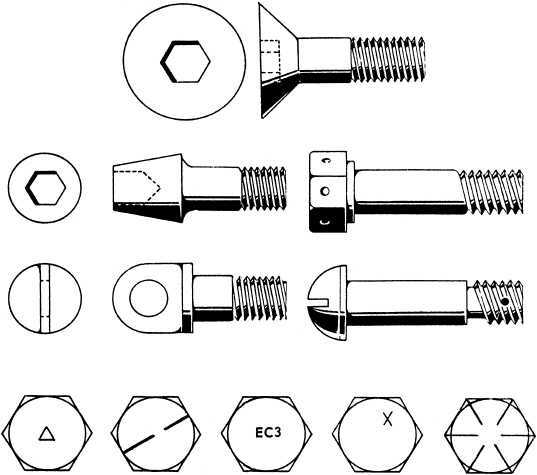 HEAD MARKINGS Figure 5-3.Types of bolts and bolt head markings. ANF0504 MACHINE SCREW STRUCTURAL SCREW SELF-TAPPING SCREW PHILLIPS HEAD REED AND PRICE HEAD Figure 5-4.Screws.